A quick and easy meal for any time of day and a great use up for leftovers. 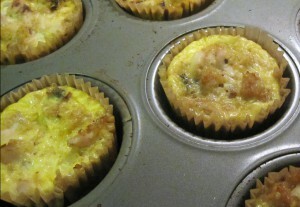 These mini frittatas have saved me many morning when I otherwise wouldn’t have time for breakfast. It’s so easy to heat up a couple and pop them into my purse to eat once I arrive at the office. Reheating eggs is tricky. These are the perfect size for reheating while maintaining moisture. By accident I found that adding spaghetti squash to the frittatas also helps maintain moisture while adding a delightful hint of sweetness. I did try this recipe in a loaf pan lined with toasted dwarf bread. This was the wrong bread to use. The chia seeds made it a little gummy. I still like the concept. I intend to try it again with a different gluten-free bread. I think something with a high coconut flour base would be good as those tend to be dry. An eggy custard soaking into coconut flour bread could only be an improvement! LOL. 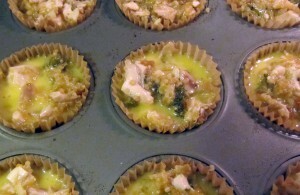 Place muffin liners in a regular size muffin tin. Portion out your chicken, veggies and quinoa into each liner. Mix eggs, nut milk, salt, and pepper in a bowl. Pour into each liner being to about a ¼" from the top. Bake in to oven for about 20 minutes. The frittatas will puff up but remain slightly shiny in the center. Cook on a baking rack for 10 minutes then serve. The regular size muffin tin is the perfect size to cook through perfectly. I wouldn't try this with a jumbo muffin tin as the inside wouldn't have time to cook through before the outside was tough and leathery. Blech! This recipe was shared with Wildly Original, Thursday Favorite Things, Full Plate, Wicked Awesome, WFMW, Real Food Wednesday, It’s A Party, Wonderful Wednesday, Handmade Tuesday, Tutorial Tuesday, Wined Down, What’d You Do This Weekend, Hearth & Soul, Mostly Homemade, Tuesdays with a Twist, Tasty Tuesday, Wordless Wednesday, Fat Tuesday, Thank Goodness It’s Monday, Allergy-free Wednesday, Delicious Dish, Waste Not Want Not, Clever Chicks, Munching Mondays, Much Ado About Monday, Happiness is Homemade, Motivation Monday, Sweet & Savory Sunday, Simple Saturdays, Round Tuit, Creative Mondays, Recipe of the Week, Real Food Recipe, Simple Life, See Ya in Gumbo, Live Simple Naturally, Saturday Night Fever and My Favorite Things. 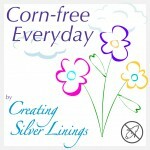 This entry was posted in Breakfast, Main Dishes, Recipes and tagged breakfast, chicken, corn free, dairy free, egg, gluten free, onion. Bookmark the permalink. Great recipe. This sounds quite tasty and healthy. I going to save this recipe and try it. Why don’t you come over to Real Food Fridays blog hop that goes live every Thursday @ 7 pm and share some of your recipes. We would love to have you. Twitted and pinned. These look absolutely wonderful. I’m going to pin this and try it soon! Stopped by from Handmade Tuesdays. So glad I did. Will explore more here. Great to have these made ahead. I get up at 4:30 for work and I’m not really into making breakfast at that tie of morning! I also like that these mini frittatas can help use up all the little bits of this and that. Thanks for sharing! These are awesome! Perfect for a one-dish breakfast on the go! I’ve never had a frittata but it looks amazing! I love a quick breakfast too. Thanks for linking up with us at Delicious Dish Tuesday! We will love your Mini Frittatas! Hope you are having a great week and thanks so much for sharing with Full Plate Thursday.